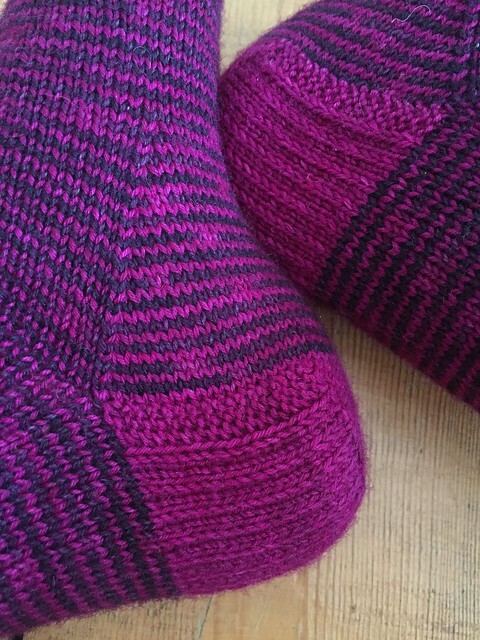 I am so happy to let you know that you can now knit my helical socks pattern – henceforth known as the Arthur to Ben socks! You can buy the pattern on Ravelry right here. These were started as part of my trip to this year’s Edinburgh Yarn Festival (near Arthur’s Seat), and finished back home in London (which is sort of near Big Ben… well not really, but it’s in the same city!). I’d been entrusted with an early sample of Travelknitter’s new ‘Hogmanay’ colourway earlier this year (lucky lucky me!) and I knew that the vibrant flashes of almost neon purple exactly matched her ‘Electric Junkyard’ colourway. It didn’t take me long to fix on this approach to make the most of the beautiful interplay between the two. As a result the Arthur to Ben socks feature helical stripes – one of those techniques which is harder to write down than it is to do, and which is also wildly addictive (single-height stripes without any jogs! you won’t want to stop). None of my brilliant test knitters had done helical stripes before, and all of them fell in love with the technique. On my sample Arthur to Bens you get these ace splashes of colour where the Hogmanay flashes meet the Electric Junkyard purple. Having seen some of the socks that my testers created I now can’t stop thinking of other colour combinations which would be amazing – orange and cream, speckles and solid, turquoise and green – basically anything goes! Instructions are included for both a standard decrease toe AND a short-row toe so you can pick your preferred option (part of my mission to convert people to short-row toes – they’re not only for toe-up socks!). 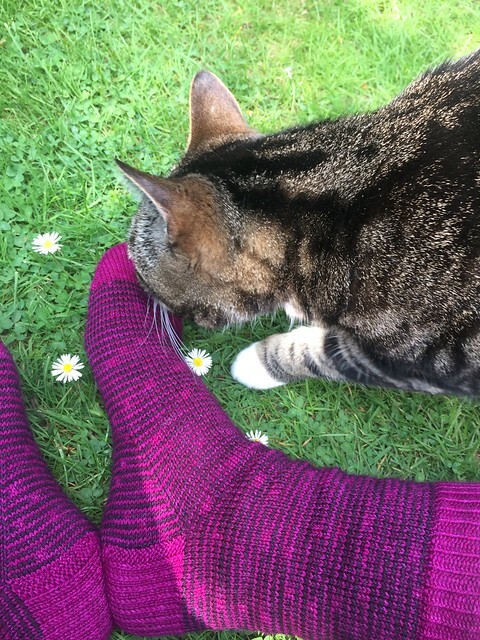 Some of my best sock-knitting tips are interspersed all the way throughout the pattern, to help you through any fiddly bits, and for you to benefit from my years of sock knitting experience. The pattern allows for a fully adjustable leg, foot length and foot circumference and instructions are given for three sizes. This is an advanced beginner pattern – it’s more than a vanilla sock, and is perfect if you want to do a stripy sock for the first time and don’t know where to start, or if you’ve never quite been able to get your head around helical stripes. Or it’ll also suit if you’re a more experienced knitter and want to follow a fun pattern with a new-to-you technique. I really enjoyed knitting these socks, and I hope you do too. I can’t wait to see more Arthur to Bens appear out in the world! 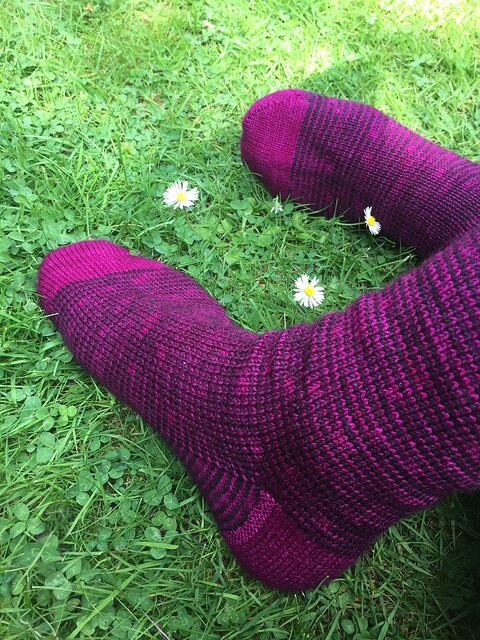 Pattern: Arthur to Ben socks – buy it now! Love, love, love! These turned out so nice. I’m going to pick up your pattern and dream about the color choices I could use 😀 Maybe this will be my next set of socks? Kudos on another pattern release! Gah! I’ve been hugely absent and missed these! Can’t wait to try them. I’d love it if you did!